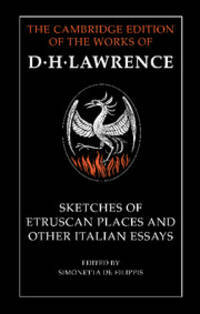 Sketches of Etruscan Places and Other Italian Essays (The Cambridge Edition of the Works of D. H. Lawrence) . 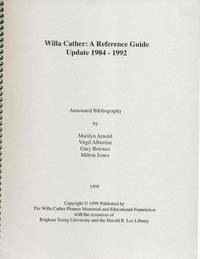 New York, NY Cambridge University Press, 1992. Hardcover First Edition Thus (1992), so stated. Very Good+ in Very Good+ DJ: Both book and DJ show indications of very careful use. Book shows just a touch of wear to the extremities; a hint of thumbing to the fore-edge; former owner's name and date at the front free endpaper; the binding shows the very slightest lean, while remaining perfectly secure; the text is clean. 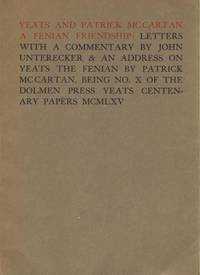 Free of creased or dog-eared pages in the text. Free of any underlining, hi-lighting or marginalia or marks in the text. A handsome near-to-new copy, structurally sound and tightly bound, showing mild wear and minor, unobtrusive flaws. The DJ shows only a touch of wear to the extremities: moderate rubbing to the panels; unclipped. Shows mild wear only; clean and intact. NOT a Remainder, Book-Club, or Ex-Library. 8vo. (8.75 x 5.75 x 1.15 inches). lxxiii, 387 pages. Edited by Simonetta de Filippis. Language: English. Weight: 1 pound, 8 ounces. Hardback with DJ. Title: Sketches of Etruscan Places and Other Italian Essays (The Cambridge Edition of the Works of D. H. Lawrence) . 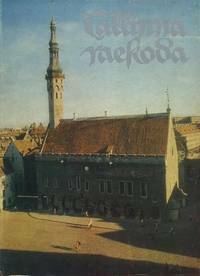 Edition: First Edition Thus (1992), so stated.